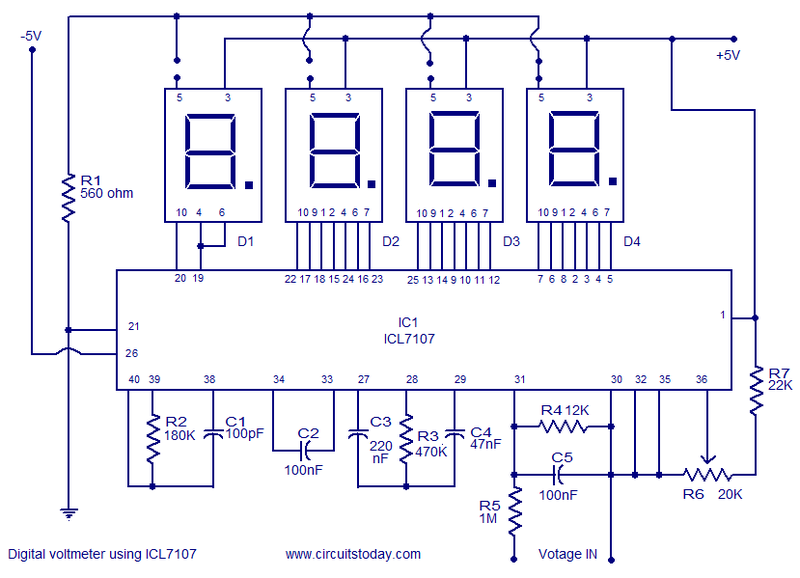 The circuit given here is of a very useful and accurate digital voltmeter with LED display using the ICL7107 from Intersil. The ICL7107 is a high performance, low power, 3.5 digit analog to digital converter. The IC includes internal circuitry for seven segment decoders, display drivers, reference voltage source and a clock. The power dissipation is less than 10mW and the display stability is very high. The working of this electronic circuit is very simple. The voltage to be measured is converted into a digital equivalent by the ADC inside the IC and then this digital equivalent is decoded to the seven segment format and then displayed. The ADC used in ICL7107 is dual slope type ADC. The process taking place inside our ADC can be stated as follows. For a fixed period of time the voltage to be measured is integrated to obtain a ramp at the output of the integrator. Then a known reference voltage of opposite polarity is applied to the input of the integrator and allowed to ramp until the output of integrator becomes zero. The time taken for the negative slope to reach zero is measured in terms of the ICâ€™s clock cycle and it will be proportional to the voltage under measurement. In simple words, the input voltage is compared to an internal reference voltage and the result is converted in a digital format. The resistor R2 and C1 are used to set the frequency of ICâ€™s internal clock. Capacitor C2 neutralizes the fluctuations in the internal reference voltage and increases the stability of the display.R4 controls the range of the voltmeter. Right most three displays are connected so that they can display all digits. The left most display is so connected that it can display only â€œ1â€ and â€œ-â€œ.The pin5(representing the dot) is connected to ground only for the third display and its position needs to be changed when you change the range of the volt meter by altering R4. (R4=1.2K gives 0-20V range, R4=12K gives 0-200V range ). The circuit can be powered from a +/_5V dual supply. For calibration, power up the circuit and short the input terminals. Then adjust R6 so that the display reads 0V. The ICL7107 is a CMOS device and it is very sensitive to static electricity. So avoid touching the IC pins with your bare hands. The seven segment displays must by common anode type. I assembled this circuit few years back and it is still working fine. can i measure 230v with this meeter? only first display is glowing and rest of them are off what should i do… ? I need pcb layout of digital voltmeter using ic 7107.somebody pls help meâ€¦. This voltmeater is working precisely. Can you help me with a schematic diagram of a digital meter that can measure ampere(0A-20A) pls.. I assembled the circuit, but only third 7seven segment is glowing, rest are glowing with very low brightness and its unreadable. Help me please. Somebody pls tell me… Does the tolerance of the capacitors used matter?? And how will it affect the circuit?? Are you shure that decreasing the value for R4 you increase the range? By my logic, I shoud be in the oposit… I want to make an amperpeter, I need the smallest range (0-2V). I completly removed R4, but it is not working linearely… Anybody tryed to use the 0-2V range? please tell me how you fixed this issue. Thanks! R5 and R4 are input potential divider. if you remove R4 200mV will be input range by reducing R4 you can achieve higher ranges. C1 C2 C3 C4 R2 and R3 are to be close tolerance components if not the measuring error will be high. Can I use this circuit to measure 220V AC? Hi Omooh you can use following link of intersil for your AC conversion to DC for measurement. I need pcb layout of digital voltmeter using ic 7107.somebody pls help me…. Has the link for the PCB layout been removed or moved I tried to follow the link with no Joy. if the value of R1 is not accurate , can there have any problem to measure accurate voltage? Please anyone help me.Thank you. easy drawing thank for publish. we want more popular easy circuit. pleas write analog maximum in put voltage? SIR HOW CAN I WIRE UP FOR AC VOLTAGE MEASURING 0-20V RANGE PLEASE SUGGEST ME. I can’t understand that the pin no. 5 of display is connected or not. pl reply. i want to connect the output of this voltsmeter to my system. can anyone help?????????????? Will this circuit work on breadboard? plz send me digital ma ma metter circut diogram thanks. Hi Rohit the basic meter is designed to measure 0 – 199.9 mV D.C. range. Modify it to accept 0 to 1.999 volt by using suitable multiplier. Convert current into mV by using a suitable conditioning resistance to measure D.C. current. For 0 – 1.999Amp as 0 – 1.999 volt 1 ohm 5 watt conditioning resistance. if you feel this drop is high use 0 – 199.9mV range with 0.1 ohm 1watt resistance and suitably shifting the decimal point. Any Circuit on the above, but suitable for measuring Amp. I made a PCB using a artwork sent by ejhgbb@gmail.com (john Gauntlet)well done, it just works fine. Hi Rohit Kumar you can try with Vega Kits Mumbai. Go through the site indicated by Patrick Vaz down load PCB design and order with a PCB maker. Can you pls design a PCB for this lovely Circuit, or if you have one already,where can i download the same. Hi Patrick a nice one you can use it. A similar project is available with PCB and the works, do check the same. Hi MJ use NE555 and generate-5volt from 9volt see the following site. How cani get -5V from my o-9v adapter?????? circuit is working properly i hav problem in proper calibration coz im new. not working properly i even cange all value of resistance and capacitance from datasheet but still got varying values any one can help…. Feel free to send your PCB image to john@circuitstoday.com – We will add after verification. 1.What is the recommended input voltage which is connected in R5 (pin numbers 30 and 31?. 2. is R4(12K) is compulsory to the circuits? if i make it short-circuited or open-circuited what will happen? I sent an email listing all of the errors and omissions I found when building this voltmeter which I thought would be useful to the constructors who were having problems but someone has edited them out of my comments, why ? Built this cct yesterday and it works really well. Power supply used 230v/10-0-10 mini tx with 7805 for +5v and 7905 for -5v plus usual resistors, capacitors and protection diodes. For switching ranges used 4 pole 3 way rotary switch, first pole changes resistor and second pole moves decimal point ( pin 5 on indicator ) from D1 at 0-2v DC to D3 ie 0-200v DC. For calibration short input and wind 20K pot until the reading is JUST 000 and calibration is spot on on all ranges with good stability. Hi, with so many complaints of thsi circuit I think I might not should trust this electronics engineeeeeeeeer! I beeternot build this,,NO? sorry can i test this meter 240v ac?.. can i test this meter 240v dc?.. Como achar o componente ICL7107 no EAGLE,estou montando um termomÃªtro no eagle com esse componente e nÃ£o estou encontrando. another site created the same.. but more explanation and proper connection. I’m constructing the circuit in EAGLE and found these problems. 1.) the PIN1 of IC and R7 should be connected to +5v. 2.) 3rd 7-segment should have the PIN5 connected to 560ohms. PIN5 is the decimal point!! the reading will be 1000v+ in this circuit. Hi, for R4=0(shorting of pin 30 and 31) then pin 5 should be grounded? can pin 5 can also be grounded through the 560ohm resistance. Kindly go through the following datasheet for 0 – 20VDC FS you have to use potential divider in the input. I built quite a same circuit, except for r3=47k & c4=470nf. I also adjusted the potentiometer to read 100mV between pin 35 & 36. I was told that these are the ext. component values for 200mv full scale. i want to operate it on a 0-20V scale. The thing is displaying erroneous values. Please help!!! plz tell me what can i do? Hi Adnan hope you are supplying both +5, common and -5 volt to pin no1,21 and 26 respectively. in the above circuit pin no 1 is to be connected to +5volt. Thanks for pointing the mistake. when i connect 3.7volts battery to the input its shows 26 volts what will i do plz help me? Hi Adnan If your final drive devices have open NPN collector then you require common anode display such that the required segment can be pulled to ground for glowing. In case if your final drive device can give high output with suffucient drive current, then you require a common cathode disply such that when ever the disply input goes high that particular segment will glow. can the circuit be used as a pressure sensor? well dude what is the range of it…. Hello. i used very familliar schematic but when i conect to +5v and -5v (Power source) i get oly eights. why? i tried everything! would you please send me the schematic used. what is cost estimation of this circuit, b’cause I really want to do one.